The predecessor of the Austin Eight, The Austin Seven. Here you will find a nice movie for the predecessor of the Austin 8, The Austin 7. The source for the article below is from "The Austin Times" from February / March 2006, and was published with kind regards to Martyn Nutland. The last years of peace were the most dynamic at Longbridge since Herbert Austin designed and launched the Austin Seven. Leonard Lord was at the helm and amongst his ambitions was the complete rejuvenation of the car range. It is perhaps fitting the outcome has been dubbed the ‘Lord Look’, most notably typified by alligator bonnets and a chrome grille that was pure Buick. Initially there were to be just four base models. For the first time since the early years of the decade, un-named and known simply by their RAC horsepower ratings, plus the prosaic code that would not have been familiar to many outside the industry and trade – Eight (AR1 and variants), Ten (GR1 similarly), Twelve (HR1) and Sixteen. The Eight and Ten made it comfortably to the showrooms before war was declared, the Twelve just squeaked in, and the Sixteen didn’t happen until after the armistice when it was coded BS1. Most would agree that of the quartet there were two stars and two ‘also rans’. The Austin Ten was hugely successful and the Sixteen was an outstanding family car giving high performance and exceptional value for money. The Twelve was a wimp – fine if you didn’t want to go very far, very fast – and the Eight has been overshadowed by almost everything. Yet, in this latter case, such a judgement is not really fair. The AR1 Eight – AS1 when it was reintroduced post-war - was the car that revolutionized the little Austin, and although it was superseded, after a relatively short time, by the overhead valve A40 (1947), and the rather more comparable A30 (1951), it was the model that brought Longbridge’s small car thinking up to date. 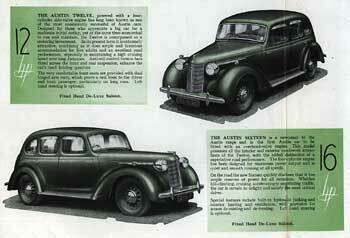 1939 Austin Eight sales brochure. For more period Austin brochures, click on the image above. The significance of this should not be under-estimated. By 1939, the year the Eight was launched that February, the Austin Seven was hopelessly out-dated, out-classed on almost every count by the Morris Eight, and trading on its reputation some mechanical elements of which dated back to WWl. Certainly, the Big Seven moved the game forward. Whether or not this vastly under-rated, but short-lived model (1937-1939) was ultimately intended as a replacement for the Ruby Seven is a matter for conjecture. The reality is the two cars were marketed and promoted as complimentary. 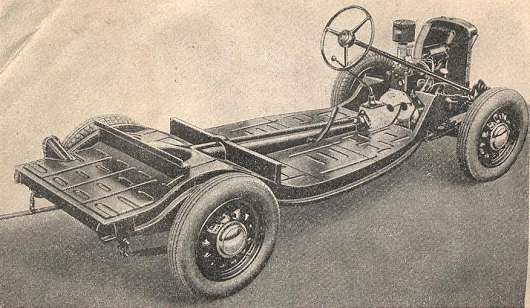 The Big Seven used the ‘ordinary’ Seven’s chassis and suspension layout and had its semi-Girling braking arrangements. But there was an entirely different engine in Austin’s, and the volume production industry’s mode of the day – combined cast iron monobloc and crankcase with a pressure fed crankshaft mounted in three shell bearings, driving the camshaft by chain and sprocket at one end and a flange mounted flywheel carrying a conventional clutch at the other. But it is a fast, yet often quoted, misconception, that the Austin Eight adopted the Big Seven engine. As has been explained in these columns the latter’s engine is markedly different yet a step forward from the Seven in the modernization process. Without repeating what has been said before, the Austin 8 has a different crankshaft and connecting rods, the entire lubrication system from sump pan to pump is different and the detailing of the valve gear has also been altered as has the manifolding, cooling and even the components for mounting the unit. That said, the Eight does have a 900 cc (56.77 x 89 mm) side valve engine (the Big Seven’s stroke is 0.1 mm shorter because of a smaller diameter for the big end journals). The power output is a tad mysterious though. When the early literature was published, 27 bhp at 4,400 rpm was quoted which was a slight improvement over the Big Seven’s 25. Indeed the valve events had been changed to allow the Eight’s inlet to open five degrees before top dead centre as opposed to tdc for its predecessor. However, one suspects some massaging of the figures as that quoted for the Eight soon settles at 24 bhp for the same revs! The mystery is further compounded by the earliest literature quoting the Big Seven’s fractionally smaller dimensions and showing an amalgam of engine features. For instance, the Eight’s hollow, barrel, tappets as opposed to the solid type fitted to Big Seven’s, but the latter’s elegant aluminium fan as distinct from the composite steel affair. Eights sport, and the drum pattern AC oil wetted air cleaner of the ‘Seven’ as opposed to the horizontal, cylindrical type, mounted at an angle across the engine bay’s left side and usually fitted to the Eight. So perhaps there were pre-production, or even very early customers’ cars that ran on partially converted Big Seven engines. Certainly items like the tappet barrels could have been changed very simply by removing the bronze guide for the Big Seven’s (and Seven’s) solid type. But of rather more interest than this wholly conventional engine is the ‘chassis’. Austin made their first move toward monocoque and adopted the same principles for the GR1 Ten introduced in May. The Twelve would retain a traditional cross-braced girder frame that after the war would be adopted by the Sixteen. The Eight broke new ground though with a steel platform that had box section side members open on the outward facing side so that when the body, which could still be detached, was fitted, it formed box sections. There were also transverse, boxed cross members - at the front and a little, further back to support the rear of the engine, two more, integral with the floor ‘pan’ beneath the front seat runners and another substantial one at the rear of the platform. In addition the side members formed ‘arms’ or ‘pontoons’ extending ahead of the interior platform, met up with the front cross piece, and added further rigidity to the structure. It is interesting the writers are loath to depart from traditional terms with which the Austin customer would be familiar – chassis, frame, diagonal bracing. None of which was really there yet the impression was there was nothing new fangled or ‘Continental’; viz-a-viz Citroën, perhaps! The road holding was enhanced by a normal suspension ‘package’. Gone were the Seven and Big Seven’s archaic transverse front spring and quarter elliptic rears in favour of semi elliptics all round. These were nearly 40 ins long at the back and underslung and nearly 29 ins in length at the front. Either Luvax or Armstrong double acting hydraulic shock dampers were used all round but at the front they were mounted transversely so the arms were parallel to the axle beam. The links changed subtly over the years. Very early output having ends curving through the bushes and later production a spherical attachment. The transverse ‘damper’ layout was intended to act as an anti-roll device and the Twelve and Sixteen actually did have anti-roll bars. Steering was, at first by ‘hour glass’ worm, and sector, with the gearbox ahead of the radiator and the side tube working back to a track rod mounted in front of the axle. Later cars had a Bishop cam T-Type system with the commendable feature of a variable ratio to reduce driver effort for close range manoeuvring. Other modernities were the use of Silentbloc bushes where appropriate. Longbridge were obviously proud of the car’s handling as one of their delightful publicity films features an Eight exclusively, storming successive passes during a day in the English Lake District. The model copes well, of course, but on celluloid has a tendency to look like a mouse on a hotplate! The Eight had a four speed gearbox with synchromesh on second, third and fourth. Overall ratios were 21.88:1 on first then 13.22, 8.31 and 5.43:1 respectively. The A30 eventually inherited a version of this ‘box, and when so applied it proved one of the ‘New Austin Seven’s’ weakest features! There was a dry single plate clutch that removed the fierceness for which, depending on your view, the original Seven, and to some extent the later models and Big Seven, were either famed or notorious. The old torque tube transmission went, in favour of a totally conventional open shaft with universal joints at each end and lifted straight off the shelf at Hardy Spicer’s in Birch Road, Whitton. The rear axle was a three-quarter floating design of the ‘banjo’ type unlike the three piece unit of early Sevens and the ‘D’ pattern of later cars and the Big Seven. Used now with splined axle shafts this meant the crown wheel and differential gearing could be removed as a unit facilitating adjustment or repair. Like the exterior of the car the interior was modern and pleasing to the eye. The instrument board was that of the Sixlite Big Seven (the two-door Fourlight had a different layout altogether) and all other Austin models of the day. It incorporated a Smiths speedometer with dark brown letters on a cream chapter ring and a matching dial with a cluster of gauges (ammeter, fuel and oil pressure clockwise from the top) was placed directly in front of the driver. The dashboard itself was a pressed steel fitting with a mock wood grain effect. The steering wheel was steeply raked but gave a comfortable and purposeful driving position. Most factory illustrations show the wheel with three solid spokes but most if not all production model had a sprung wheel same as the rest of the range. There were carpets front and rear but as on the Ten these were not fitted over the gearbox which was concealed by a rubber moulding with the gear positions in relief. On the ‘sunsine saloons’ there was leather upholstery for the seats. Pre-war the driver’s had a trigger adjustment and the front passenger’s could be relocated by fiddling with clips underneath the tubular frame. Post-war car’s had proper adjustment for both seats. They also had a rear window blind controlled by ring and string pull from the command module and a sun visor which you didn’t get pre-war unless you chose the model with the sliding roof. You did get an interior roof-light however. Outside there were self-cancelling trafficators running off the six volt electrics and chrome bumpers, but no over-riders, which is an easy and quick way to tell an Eight from a Ten from the front! Indeed at the back the bumper only protected the quarters and another dead give-away when viewed from the rear is the Eight’s single pane window. The Ten has a divided one as on the Twelve and Sixteen. Reverting to bumpers for a moment, the pre-war cars could be lifted by attaching a ratchet operated jack to the bumper bracket at the relevant corner. Post war cars had a trap ‘door’ on either side forward of the front seats through which a Stevenson’s telescopic jack was lowered and operated with the wheel-brace. The van had a screw jack hand-me-down from the Seven. The little Eight was just over 12’ foot long overall and 4’ 8” wide and when it was launched there were six options. The most basic was a two door saloon (Fourlight Saloon) without a sunshine roof and costing £128 - £139 with - model code ARA. For the same £139 you could have had instead a four door (Sixlight Saloon) with a plain roof or one with a sunshine roof for £149. The four door model code was AR. Unusually, by today’s standards, something a little bit more exotic was, with one exception, cheaper. A lovely two door tourer cost £132 and a whole ten shillings, and its four-seat counterpart a round £135. They came with a hood and side curtains the latter being stowed when not in use in a special rear compartment. The windscreen folded flat and there were cutaways to the tops of the door so hairy drivers could jump in if they wished! The body shells were the same but on the two seater the rear seat was replaced by a large, flat, luggage platform making the model ‘very attractive for touring’. The code was AP. There was also a pretty little 6 cwt van – AV. Colours for the saloon cars were blue, black, maroon and grey and the same for tourers except blue was deleted. 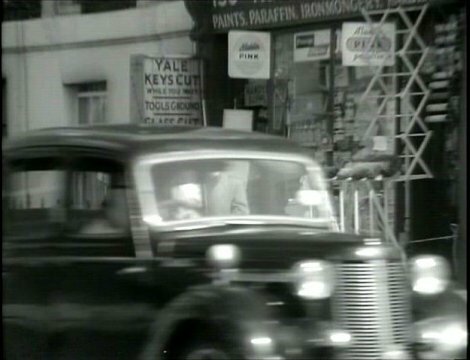 Production of the Austin 8 cars ceased for the duration in 1942 and of the van in 1940. By then about 46,400 had been made. A proportion of those would have been for military use – some saloons, some two-seater tourers. 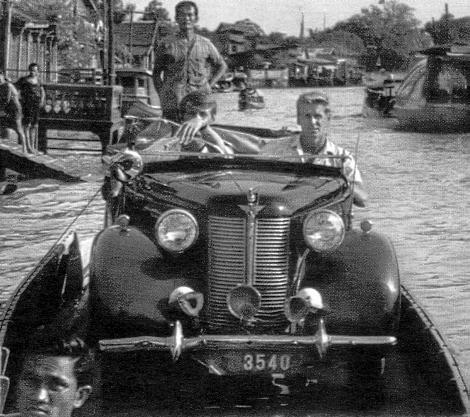 The latter were outwardly distinguishable from the civilian version in that they had two large, near-vertical louvres in the scuttle instead of the chrome embellished horizontal slit in the bonnet side panel. The wheels were also of a disc type without the perforations of the peace time cars and the front registration plate was often above the bumper bar instead of below it. Most probably the only difference to the engine was that the coolant inlet on the right side of the block was cast steel and not aluminium. But there may have been other detail changes. Austin Eight as build for the armed forces with disk wheels without perforations. Austin Eight for the armed forces in action. Apart from Austin Eight vehicles commissioned by the armed forces their engines found a variety uses. These included use in the Beresford Stork portable fire pump and of course, for the airborne lifeboat where they had a dubious reputation amongst ‘the powers that were’. Other appearances were as the machinery for merchant ship lifeboats where they adopted the model name, Thetis, as applied to Austin Seven marine engines since the mid-1930s. Marinization took the usual form of major modifications to the cooling and lubrication systems, the application of a wet plate clutch and adoption of magneto ignition the latter also being fitted to the stationary engines. 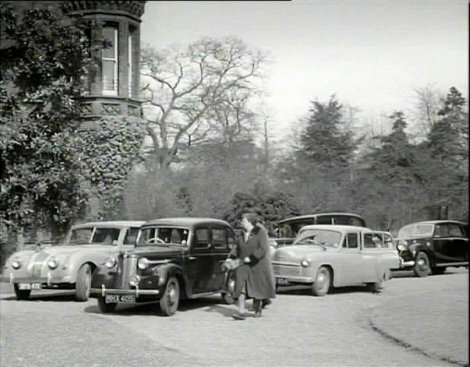 Production of the Eight car and van recommenced in August 1945, but there was now only one private version – the four door saloon re-coded AS1. The van was AV1. Numerically the model was Austin’s most successful car of the post-war era, out-stripping even the Ten with sales between 1945 and withdrawal in 1947 of some 56,000 - 500 more than the larger model. The price though was now well over £300! The marketing of any car is fascinating and the Austin 8 no exception. There was nowhere much for the company to place the Seven other than as mobility for the masses or ‘introductory’ motoring. By the time the Big Seven came along the customer for economy cars was much more sophisticated and that model was positioned rather differently – perhaps too much so. Combined post war advertisement for the Austin Eight range 1946. For more period Austin adverts, click on the image above. 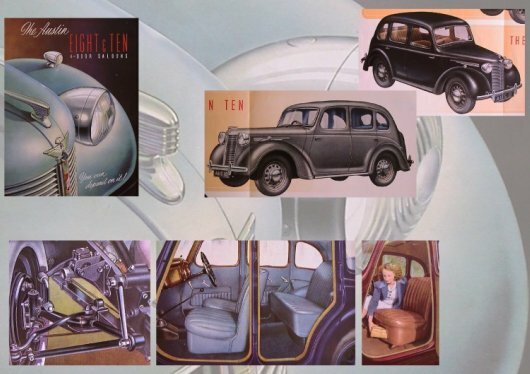 Combined post war brochure for the Austin Eight and Ten 1947. 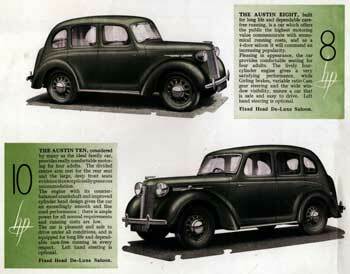 Combined post war brochure for the more luxury and bigger Austin twelve and sixteen. 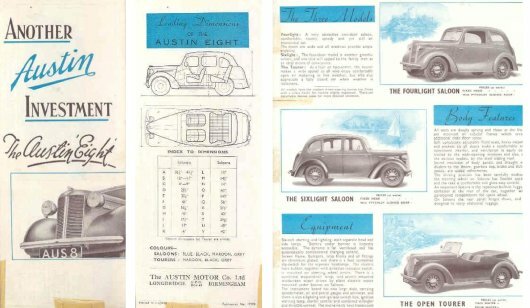 Post war Austin 8 and Austin 10 sales brochure. 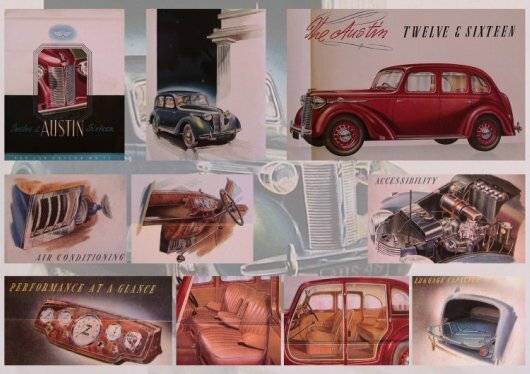 Post war Austin 12 and Austin 16 sales brochure. Austin Eight for Male or Female drivers ? The publicity films portrayed a mature, discerning male motorist who preferred a small car or, in their printed advertising, someone who, if not an enthusiast, had more than a passing interest in cars. The Austin Eight customer is different again. Certainly the early literature attempts to the middle class male who has, perhaps, just one child, but the main thrust is at the ladies. The chubby hole, at eighteen-and-a-half inches is even deep enough to accommodate a ladies umbrella. She is shown jacking the car, adjusting the seats, operating the sun roof, stowing the tourer side curtains and even removing the bonnet panels. And its amazing how it worked. Even the long wheelbase late Eighteens were projected as suitable for affluent women in their prime, and whereas I doubt whether many in precisely that group bought the Windsor, elderly ladies certainly did! A woman handling the side bonnet panels. A woman handling the car jack. The glove compartment big enough for a ladies umbrella. Austin Eight over shadowed by almost everything ? Longbridge party five years later; for example  a well designed chassis, semi elliptic springs all round, hydraulic shock dampers, Bishop cam steering, hydraulic brakes, an SU carburettor, and electric fuel pump. The only thing it lacked was four speeds and that didnt matter much as it could do 35 in second then accelerate briskly to 50, and well beyond, in third. On top of that it was roomier and more comfortable than an Austin Seven. Finally, garage owners that knew the Austin Eight and GRQ/GS1 Ten when they were popular everyday cars, loathed them. They will tell you that they both sold like warm baguettes because they were so pretty  especially the new Lord Look Ten. But the engine was a workshop disaster. Although the technical design of the car might be out dated it had a modern and good looking operating panel. The modern operating panel of the Austin Eight. Some nice period pictures for the Austin eight. First in the row, an Austin Eight six light saloon. This is the fastest you will get with your Austin Eight Four light Saloon. Production records Austin Eight and what is left. Nowadays the Austin Eight is known as one of the rarest and nicest period cars of Longbridge. Although the original specification mentioned a top speed of 60 mph, a neat and very pretty little 40 mph, and on a good day may be about 55 mph, would be a more appropriate figure. It is nowadays seen as a reliable and pretty vintage car, which you are able to enjoy as long as you are not in a hurry !! From the total of about 56.103 Austin Eights produced only a few hundreds are left. The post war four door six light saloon is most produced and therefore the model you will find the most. The pre war versions are rarely found any more. There are about 100 six light saloons known, about 30 two door saloons and even some less tourers. During the production of the Austin Eight, Austin manufactured the one millionth Austin in 1946 for which you will find an advertisement below. 1946 advertisement for Austin's one millionth car. Austin 8 brochure 1939, 20 pages. Austin 8 brochure 1945, 4 pages. Austin advertisements out of 1943, do not advertise the car itself, but is more a warning to the customers to save tyres which are hardly available during the war. Below you will find two examples of these advertisements. 1943 Austin advert, not for the car, but a warning to safe tyres, which were rare during the war. Road tests and articles about the Austin Eight. Below you will find some road tests and articles for the Austin Eight. 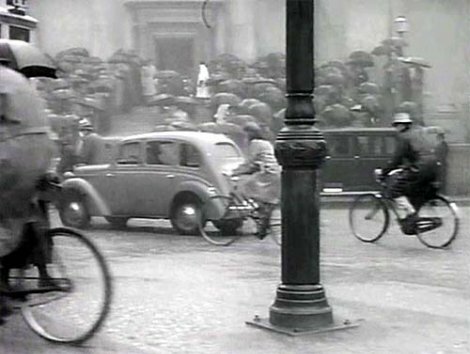 Road test Austin Eight Practical Motorist April 1 1939. Click on the image for a high resolution version. According to below article out of The Autocar of May 23, a second hand Austin Eight of 1939 costs three times the new price of 1939. Article "USED CARS ON THE ROAD" Austin Eight 1939. The Autocar May 23, 1952. Handbook & service manuals for the Austin Eight. Below you will find some examples for the period time users manuals and work shop manuals for the Austin Eight. Advert for Castrol lubrequipment showing an Austin Manual, in this case an Austin ten handbook. Original Austin Eight handbook 1939. Original Austin Eight list of spare parts 1939. Original Austin Eight Service Manual 1949. Published in four editions starting in 1935 till 1960. This is an example of the fourth edition printed in 1956. Including original red over cover. Without original red over cover, how you will find them the most. For Decades, the Austin Eight was largely unloved. 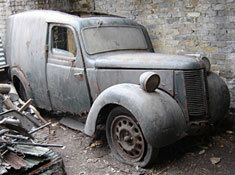 The Austin Eight has been largely unloved for a long period of time and therefore the survival rate remarkably low. There are a variety of reasons for this. In the first instance they most certainly lack the sheer, love it or hate it, personality of the Seven. And lets face it most motoring enthusiasts love it - to this day. And the same applies to the Big Seven, it oozes character and is of conspicuously better quality than the Eight. Furthermore, by the very nature of its construction, the Austin Eight has to be a rot box and many succumbed to that malaise once the MOT was introduced; and many more have since. This is how most Eights have ended due to unpopularity for a number of years. 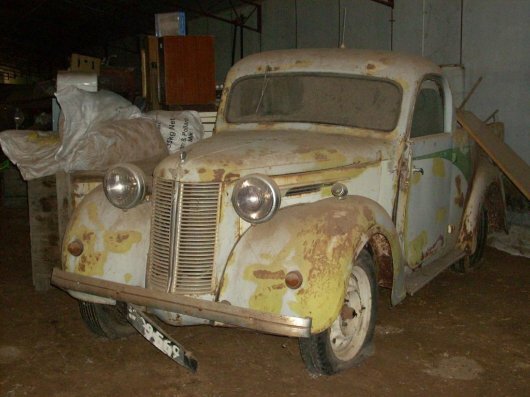 This Austin Eight was even rebuild as pick-up and is now resting his case. 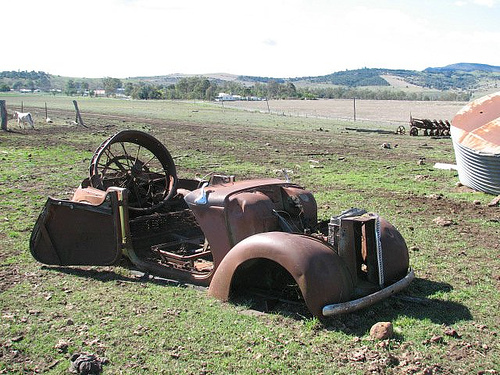 Ones this was an Austin Eight Tourer. What was available after the Austin Eight ? The followers for the Austin Eight were the Austin A-Series, like the A30, A35, A40, A70, for which you will find some examples below.